This delicious carrot cake is sure to impress your friends and family with it’s secret ingredient of crushed pineapples. 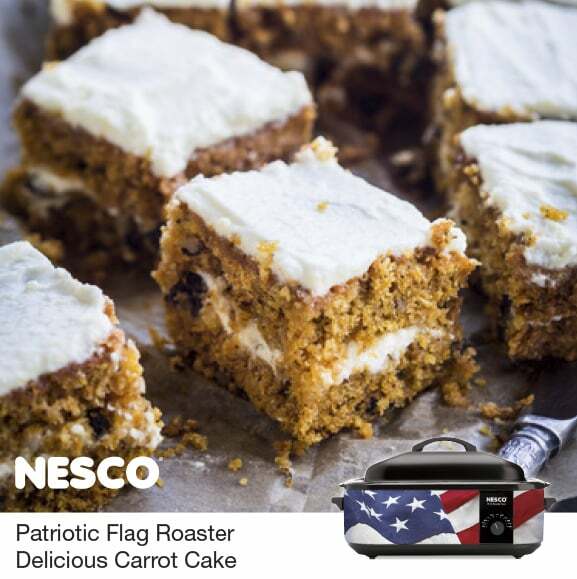 Baking the cake in your Patriotic NESCO® Flag Roaster will make any get together extra special, as well as make your cake nice and moist. Preheat NESCO® Roaster Oven to 375º F.
Beat sugar, vanilla, eggs and oil in large mixing bowl. Mix in carrots, flour, spices and pineapple. Beat on medium speed for 2 minutes. Pour into greased 13 x 9 cake pan. Set on rack in cookwell and bake at 375F for 50 to 60 minutes. Cream butter and cream cheese. Beat in remaining ingredients until light and fluffy.